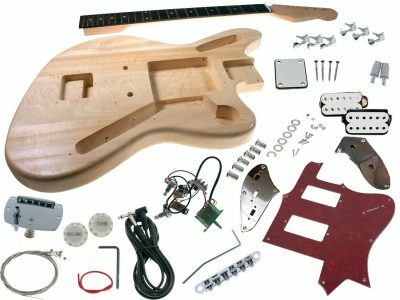 This DIY guitar kit has everything you need for building your own custom ST Style Electric Guitar. You will need only some basic tools and finishing supplies. All challenging wood cutting, drilling and shaping is already done professionally, as well as fret leveling and dressing. A detailed manual is included with step by step instructions. This is was my first project and I’m very pleased with how it turned out. Sounds great! 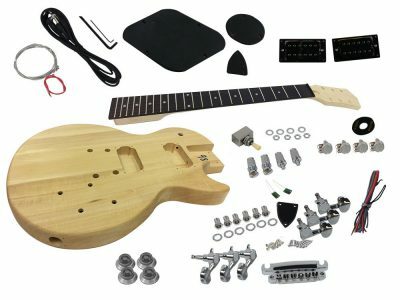 The kit has everything needed to build the guitar. Highly recommend this. i thought it would be fun to try a build. ive never played electric guitar, only acoustics. My expectations were,i think, realistic in a kit for this price. It shipped and delivered very fast. The overall quality of the wood grain, fit,finish of parts,chrome,the parts being protected by film,etc. are impressive and i have to say exceeded my expectations. even included is a length of solder ! The instructions are o.k. but i had to research and ask about a couple things that arent clear in the instructions like pos. vs. ground on the jack and some details of the set – up but i got responses to my e mails to solo and spent some time on line.I took a weekend to sand the body and neck and finish the neck. The week was spent painting the body (red) and then today i assembled and set -up. Ive played it a bit and continue to learn about the set-up and i have to say its pretty cool to build. I love it in flag red with semi-gloss. Take your time with the finish – mine turned out better than i anticipated ! Great kit! 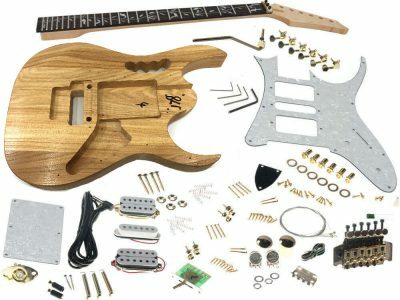 I purchased this DIY guitar package with “0” experience building or setting up guitars. 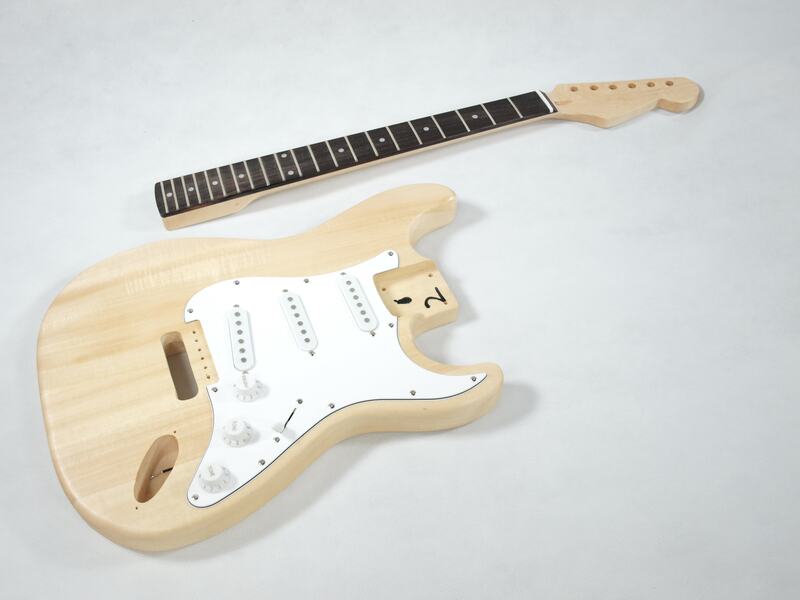 With the body predrilled, the neck in phenomenal shape out of the box and pre-wired pickups, this is great for all levels of experience. Guitar was shipped 10 min after order was placed, awsome product for the price. I am not a luthier; I am just a regular guy who loves playing guitar. This product is fantastic. 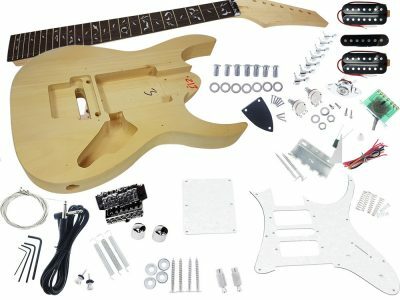 I pretty much built my own guitar with ZERO experience. Every guitarist needs this product! 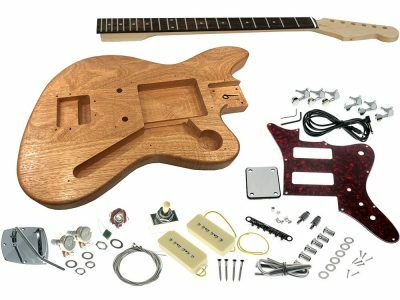 Every guitarist needs to experience building their guitar. I can only say great things about the product because it is simply the truth. I leveled the frets and got the action down to 3/64 so it plays really nice. I bought the black hardware pack, so I upgraded the nut with a Tusq XL since I was taking the old one off. Haven’t had any tuning issues. Other than the stock tuners aren’t that smooth so getting the guitar tuned to begin with is a challenge. I’m keeping my eye out for better tuners. I found the pickups too shrill for my tastes, even for strat pickups, so those are also on the list for future upgrade. All that said, I gave it 5 stars cause it met my expectations for the price point. I just finished my kit and was very pleased with the results. Finishing the neck and body was a bit goofy. I used Circa 1850 Tung/Teak oil to start but wasn’t happy. I mixed a dark stain with the Tung oil and went over it again. Finished the neck with a thinned satin Varathane and sprayed the body with gloss Painter’s Touch Ultra Cover 2x. After sanding and polishing it came out great, as far as I’m concerned. The rest of the guitar went together easily, all holes were in the right spots and everything fit perfectly. The frets didn’t require any work but after it was together and I started playing I could feel the ends very slightly. I will take the strings off and dress the ends of the frets when I get a chance. I was very happy with the price, quality and especially the service. I wouldn’t hesitate to recommend the kit to anyone. Thanks Solo. I’m 3/4 done my first guitar kit. Building it for my father who Iives in Australia. My first impressions were very good well built and solid. My dad played a guitar called a Maton Fyrbyrd in the 60’s and had to sell it to buy my mother’s engagement ring. He was very good, so I thought it would be a nice surprise for him. I’m painting it the same colour body and resprayed the pick guard candy apple red. I only have to sand the neck and headstock and polish it. Then assembly. For a first time kit I have found and would throughly recommend this kit for beginners. I’ll take a photo when it’s complete and put it on your Facebook page. I’ll be getting another one. Just don’t tell the wife! The neck pocket on this was very very loose, thankfully the neck did set straight. For ~$120 after shipping, this kit is decently put together with some minor issues that can be fixed with sanding. I found glue drippings on the fret board and the neck pocket had to be shimmed. There were no dents, gouges, or broken parts in the kit. The pickups did leak something like oil all over my desk. All in all the issues I have with this are all very fixable and easy fixes at that. There are many pros with the kit too. The stray style is easily modified. The wood grain is nice and looks great stained. The neck (once sanded and frets levelled crowned and polished) feels like a $1000 guitar. As I said before, this is a great kit and I would definitely buy again. Hope this was helpful to anyone looking to buy this. My ST Kit turned out great!! Very happy with it. I have 5 other Fender Strats and the playability of this guitar build is up there. Takes some patience when staining and polishing but it was worth it. Very nice, the kit turned out great. Like everyone else has said, if you take your time and pay attention to details, you’ll be satisfied with the results. I did a few minor upgrades such as a Tusk XL nut, different tremolo springs and Ernie Ball super slinky 9’s. The end result is a great playing instrument that I’m proud to show to anyone. 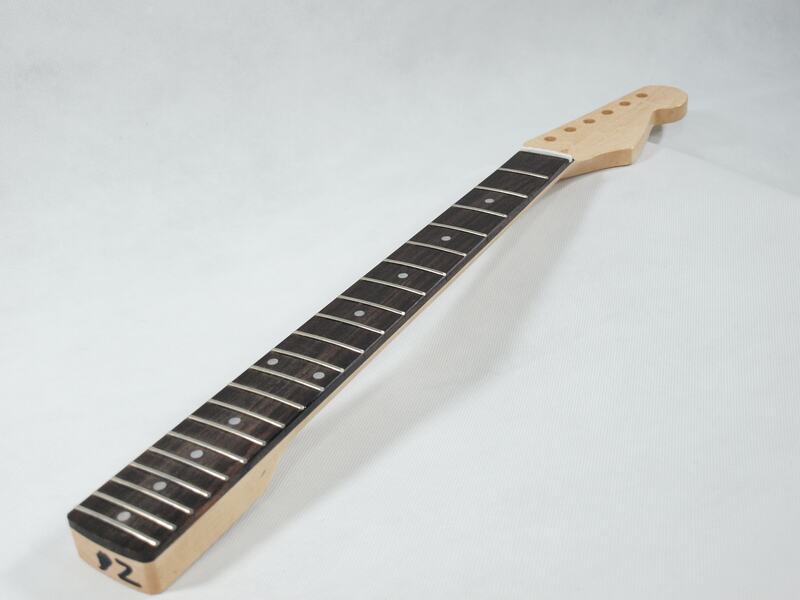 First the wood: it’s very nice, clear grain, the neck was nice. I wish that it would come without the sealer on it, it really makes you have to work hard to get the sealer off to do a decent job at staining. I’m guessing that by sealing it at the factory it eliminates some warpage and cracks that might happen with the different environments it gets shipped to. However, with some elbow grease, it came out fine. I finished it with an ebony Minwax stain, black-out on the sides with a little Krylon, waited 24 hours and applied 4 coats of clear poly – the neck was done with 4 coats of clear spray poly. I’m happy with the look. 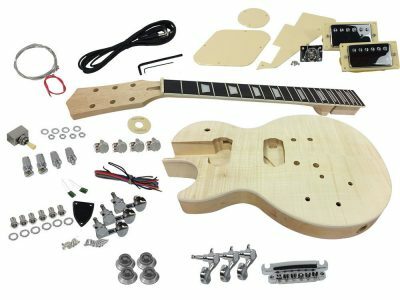 Assembly is easy – plenty of videos out there that show you the ins and outs of assembling and setting up the guitar. I put copper tape inside the electronics cavity and taped the inside of the cover as well to insure I had a good Fariday cage around the electronics. I also replaced the wires that go to the output jack with some shielded wire. The result was no hum even at the highest volumes… nice. Setup: well, let’s just say when Solo says that the frets are leveled, umm, well, they needed more work to satisfy me. That’s OK, I did a darn good job leveling the frets, reshaping them, and insuring the 12″ radius was correct. The neck setup was easy. Like I said, I replaced the nut, re-cut the slots and set the action at the nut for .006″ on the high E and .010 on the low E (interpolated between). Next the tremolo – the quality of the unit was good, but I’m just not a fan of them so I hard tailed it. I used the 3 springs that came with the kit but I still got some inter-string coupling when I did heavy bends or adjusted the tuning. I put 2 more springs in, set the bridge even with the surface of the guitar body and voila rock solid. Intonation was a breeze and the bridge action height was a breeze – but I had to lift the low E up a tad higher than I’d like but maybe only an additional 1/64th… no biggie. The guitar plays well, it exceeds my abilities (which isn’t saying a lot). 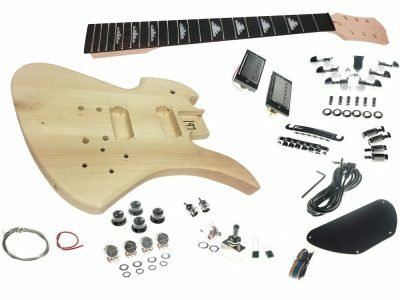 I STRONGLY recommend that you buy this kit and learn how to setup and assemble a guitar if you want to completely understand the ins and outs of our instruments. I learned a TON and was able to tweak the setup on another guitar that I have because of what I learned here. For the purchase price and a few dollars in shipping, some elbow grease, and some determination and research you will end up with a fine instrument. I’m sure I’ll buy more from Solo, seems like a great company. I wish there was a way to add photos here to show the finished product. This is a solid kit. The pick ups are not the worst in the world but i plan to upgrade them. Same goes for the pots and capacitors. The neck fit snugly and it feels great to play. The electronics come pre-wired in pickguard, so all you have to do is solder the jack and claw ground. I wish the nut was higher quality but it works none the less. A lot of people think the tuners are cheap but if you tighten down the screw at the top of each they stay in tune for a long time, even when playing hard. Overall this is a great kit and i enjoyed building it and I enjoy plating it.